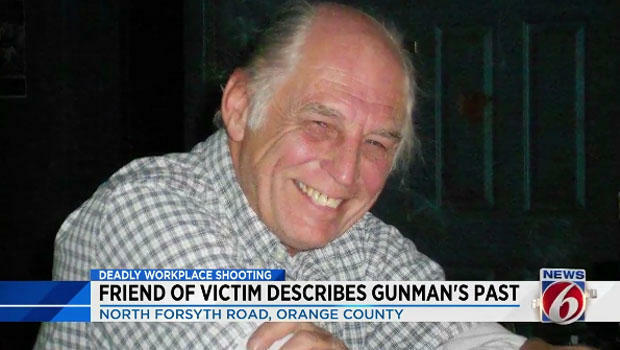 ORLANDO -- One of the five victims fatally shot by a disgruntled former co-worker at an Orlando awning company Monday was fearful the suspect might seek revenge for being fired, reports CBS affiliate WKMG. Police say 45-year-old John Robert Neumann, Jr. singled out and fatally shot the five victims in the head before killing himself at the sound of approaching sirens. He did not appear to belong to any type of subversive or terrorist organization, Orange County Sheriff Jerry Demings said. "My experience tells me that this individual made deliberate thought to do what he did today. He had a plan of action," said the sheriff, who wouldn't say why Neumann was fired in April. Demings said Neumann had a "negative relationship" with at least one of his former co-workers in Orlando, and he singled out the former colleagues who were shot. Lillian Crouch, a friend of shooting victim Robert Snyder, told WKMG that Snyder was the lead manager at the factory, Fiamma Inc. Crouch said Snyder told her he fired Neumann in April over his violent tendencies, and that at the time he feared Neumann would return for revenge. Crouch said she hadn't heard Snyder mention Neumann recently. "[Neumann was fired] because he was starting fights with people," Crouch said. "[Snyder] told me about this guy that had started trouble. He started a fight with somebody." Authorities had confronted Neumann once before at the factory, when he was accused of battering a co-worker in June 2014. But no charges were filed after both men were interviewed, and that co-worker was not among Monday's victims, the sheriff said. In a 2014 incident report, Neumann's co-worker said Neumann punched him in the back of the head when he approached, knocking him to the ground. But the co-worker later changed his story, saying Neumann had chased him and then hit him on the back of the head. The co-worker, who had no visible injuries, stated "he had problems in the past with John but thought they were resolved," the sheriff's office incident report said. Friends recalled Snyder as a husband, father and grandfather who worked daily and would typically visit the Fiamma Inc. factory about twice a week. He was 69. Police identified the other four victims as Brenda Montanez-Crespo, 44; Kevin Clark, 53; Jeffrey Roberts, 57; and Kevin Lawson, 46. The Lake Howell Pop Warner league, a local youth sports league, said Tuesday that they are raising money for the children of Kevin Clark, who were orphaned by the shooting. The league says on a fundraising website that the children had already lost their mother nine years ago. Clark's 14-year-old daughter was a cheerleader in the league, and his 18-year-old son played football in the league for several seasons. The shooting began after Neumann slipped through a rear door into the cavernous Fiamma Inc. factory, an area larger than two football fields where awnings are stitched together for recreational vehicles. He paused at least once to reload. Seven other workers were inside at the time but were unharmed. State and federal law enforcement officers converged on the industrial park shortly after 8 a.m. after a woman ran out and called 911 from a tile business across the street, said Yamaris Gomez, that store's owner. "All she kept saying was he was holding a gun and told her to get out," Gomez said. Deming said investigators were looking through any social media postings for clues. Neumann was honorably discharged from the U.S. Army in 1999 and did not have a concealed weapons permit, the sheriff said. Neumann had a record of minor crimes, none violent, dating back more than 20 years. Most involved traffic violations: driving under the influence, driving with a suspended license, giving a deputy a false name and leaving the scene of a hit-and-run involving property damage. Searching for a motive, deputies cordoned off a trailer park in Maitland, where Neumann lived alone in a mobile home on a busy road next to a funeral home, a used car lot and a dog-grooming business. Like the awning factory, it's far from Orlando's famous theme parks. Arnie Boyd, who lives in the same trailer park, said Neumann was not particularly social. "Every once in a while, he would ride his bike around and that's it," Boyd said. "We would speak only once in a while." Authorities had no reports of any specific threats the gunman made to people at the company or anyone else, but that's why people need to alert authorities whenever they learn of anything that could lead to violence, said Special Agent Danny Banks of the Florida Department of Law Enforcement. U.S. Sen. Bill Nelson noted that next Monday will mark a year since the worst mass shooting in modern U.S. history at a gay nightclub in Orlando. The attack at the Pulse club killed 49 people and wounded dozens more. "The city of Orlando, which is still healing from the Pulse massacre, has seen too much violence this past year," the Florida Democrat said in a statement.